Groceries, post and even pizza are now being delivered to remote parts of the world, previously cut off because they lacked an address. In Mongolia, people can apply for a bank account using three words to identify where they live. The system divides the world into 57 trillion 3m sq (9.8ft sq) squares, each with a unique three-word address. What3words was at Arusha, Tanzania’s TEDGlobal conference, updating its effort to give “everyone an address”. “Without an address you might as well not exist,” said the UK start-up’s co-founder Chris Sheldrick. A charity in Durban, South Africa, is using the system to provide three-word addresses for 11,000 pregnant women. “They would previously call an ambulance and it would take hours to find them. Now they can just call and give the three-word address,” said Mr Sheldrick. Domino’s Pizza is using the system to deliver pizzas in the Caribbean island of St Maarten. 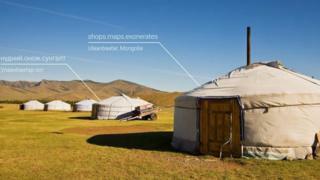 What3words has just signed a deal with Khan bank in Mongolia that will allow residents to put the three words that make up their location on a form when applying for a bank account. “The safe and secure delivery of credit cards to the hands of our customers is critical for us,” said Javkhlan Turmunkh, deputy chief executive of Khan Bank. Earlier this month, What3Words also signed a deal with the Nigerian postal system. Nigeria is one of Africa’s biggest economies, with more than 180 million people – but only 20% of its inhabitants are able to receive their mail at home. The Nigerian Post and Telecommunications Service has set a target to increase this to more than 70% within the next two years. The system has already been adopted by postal services in Mongolia, Ivory Coast, Tonga and the Solomon Islands. Chris Sheldrick began the firm in 2013, following a 10-year career as a musician. “Every day we would go somewhere new and people always got lost. I tried getting my band to use GPS co-ordinates but they were resistant or typed the co-ordinates wrong. They came up with a mathematical formula and list of 40,000 words. Initially in English, the system has now been translated into 14 languages. What3Words has, however, faced criticism, not least for the restrictions it places on how its data is used and the fact it charges companies to incorporate its service into other products. And despite the progress outlined at TEDGlobal, the platform has a long way to go before it could be described as being mainstream. Edward Anderson, chief technologist at the World Bank in Tanzania has looked into customising the system to make it easier to deliver textbooks to secondary schools and for identifying broken water pumps around the country. “It is a neat idea but it is not immediately obvious what the problem is. In order to look up the three words you need to have GPS co-ordinates so it is not about figuring out where you are but more about telling other people where you are,” he said. He said that there could be a market for the system for voice-activated services.